The Rev. Sally W. Ott (retired supply pastor) to Newtown UMC (½ time), effective Jan. 1, 2017. "This is a great opportunity to visit with men, women, and children who have been blessed by our ministries, or to discuss ideas for new ways of helping struggling families in Lancaster," said Correen Russo, Executive Director. She also invites people interested in serving on the board or learning more about LUMINA's ministry in the Lancaster area to "please come!" E-mail her by Nov. 16 at office@luminaoutreach.org. LUMINA is a collaborative mission project of the Eastern PA Conference and the churches of its Southwest District. See their most recent newsletter and download the event flyer. You can also support LUMINA today by donating on its behalf to Lancaster's ExtraOrdinaryGive campaign at ExtraGive.org until 11:59 tonight. Part of your donation will be matched by local sponsors. Learn more at www.ExtraGive.org. Please let us know your plans for celebrating Thanksgiving and Advent, so we can list and promote them on a special page we created on our website. 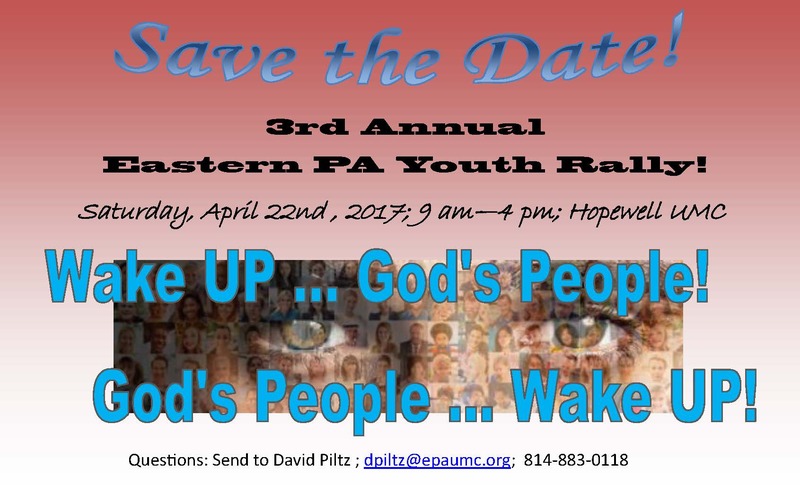 Send your details asap to communications@epaumc.org. Thanks! Arch Street UMC in Philadelphia is providing sanctuary for Javier Flores García, 40, an undocumented Mexican immigrant and a husband and father of three. The church, which is part of the national New Sanctuary Movement, welcomed him into asylum the day before he was to be deported and hosted a press conference last Sunday, Nov. 13, following morning worship. The Eastern PA Conference Office will close at noon on Wednesday, Nov. 23, for the Thanksgiving holiday weekend and will reopen on Monday, Nov. 28. Wishing you and yours a blessed Thanksgiving that inspires both gratitude and generosity. Should we have church on Christmas Sunday, especially if we just had church on Christmas Eve? (And what about church on New Year's Day, which also falls--or rather, rises--on a Sunday?) What if hardly anyone will come to church, while their households are so busy preparing meals, opening presents, hosting guests and...well, celebrating Christmas, the birth of Christ. Bishop Peggy Johnson has an answer that some will welcome, and others maybe not so much, in her new Advent essay, "An Inconvenient Christmas." You may recognize it from her Faithfully Yours column in the fall issue of NEWSpirit newspaper. By the way, UM Communications likes her reflection so much it plans to feature it soon on www.umc.org so more folks around the UMC connection can read it. But you have a choice. You can read it on our website or in her Bishop's Blog . But please do read it, as you decide what you will do about having church on Christmas. Also, be sure to read Bishop Johnson's insightful, reassuring but challenging blog essay "I Voted, I Vote," where she writes, "Election Day is over, but we still get to vote every day of our lives by the stands we take, the letters we write, the money we donate, the evils we decry, the good we promote." Whether we are sad or elated with the Presidential election outcome, she challenges each of us, in the words of an old hymn, to "'Rise! See the world through faith-filled eyes!' And vote for peace and justice every day with your life, never forgetting that God is the ruler yet!" The Rev. Sally W. Ott will leave her conference staff position as Development Coordinator for Camp & Retreat Ministries at the end of November. She has been appointed to serve as pastor of Newtown UMC in Columbia, as of Jan. 1, 2017. The Rev. Dorcas Kumba Kamanda, the current pastor, will leave to establish an orphanage in her native Sierra Leone, where she will serve children whose parents have succumbed to the Ebola disease. "Imitation is the sincerest form of flattery," a New York Annual Conference staff member reminded Marilyn Schneider, head of our conference's Prison Ministry & Restorative Justice (PM&RJ) Team, when asking to copy the popular Christmas Cards to Inmates project. In fact, not just the project, but the cards, too.